Joseph Mallozzi's Weblog: October 14, 2010: Joe Abercrombie’s The Heroes! Early birthday gifts and wishes! Marty G. a Tokyo no-show! Snow Monkeys Rule! October 14, 2010: Joe Abercrombie’s The Heroes! Early birthday gifts and wishes! Marty G. a Tokyo no-show! Snow Monkeys Rule! Yes, that’s right! 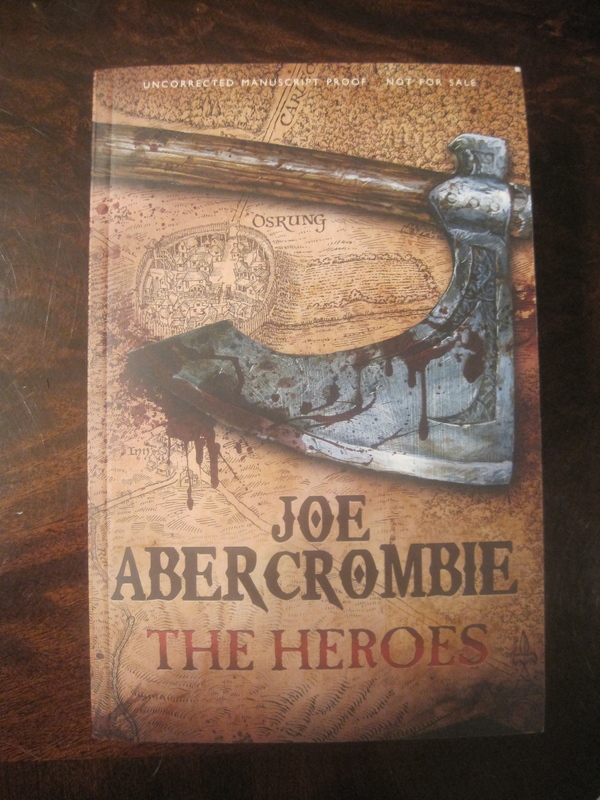 It’s an advance copy of Joe Abercrombie’s latest: The Heroes. For those of you not in the know (and, really, you should be if you’re up to date on my blogly matters), Joe not only happens to be one of my favorite authors (check out The Blade Itself, the first book in his awesome First Law trilogy and go from there) but a close personal friend of Baron Destructo. I’m dying to get started on it but, unfortunately, have had to put off my reading until I complete a first draft of that infernal script. I’m aiming for Monday but I fear that maybe overly optimistic given that I’ll be spending all of tomorrow in editing on episode 16, The Hunt, which is two minutes long with about another five minutes owing. Back in early high school, I honed my French reading on Goscinny and Underzo’s Asterix and Obelix comics. About five years ago, I picked up the collection – en Francais of course – and re-reading them brought back all sorts of great memories (like the time the boys traveled to Egypt and met Cleopatra, or the time Panoramix went missing on a druidic convention). 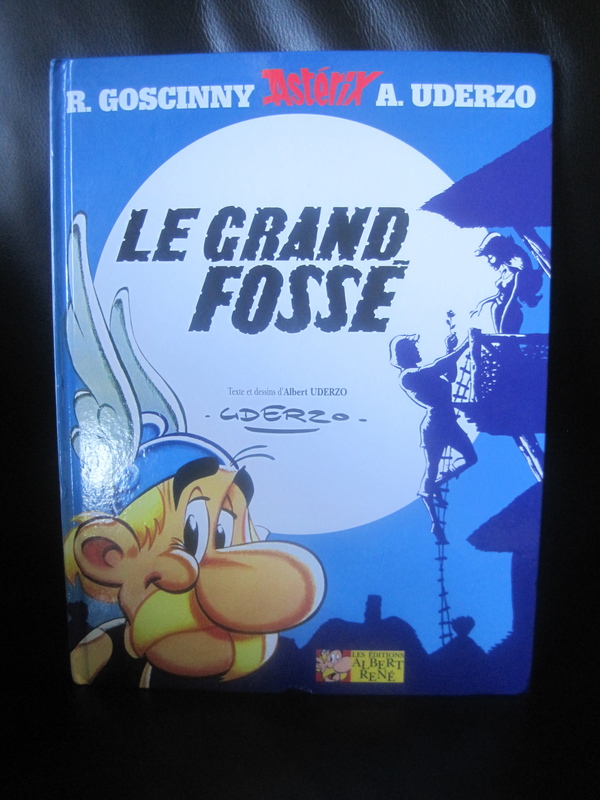 This copy of Le Grand Fosse comes compliments of blog regular, Anais. Merci, Anais! 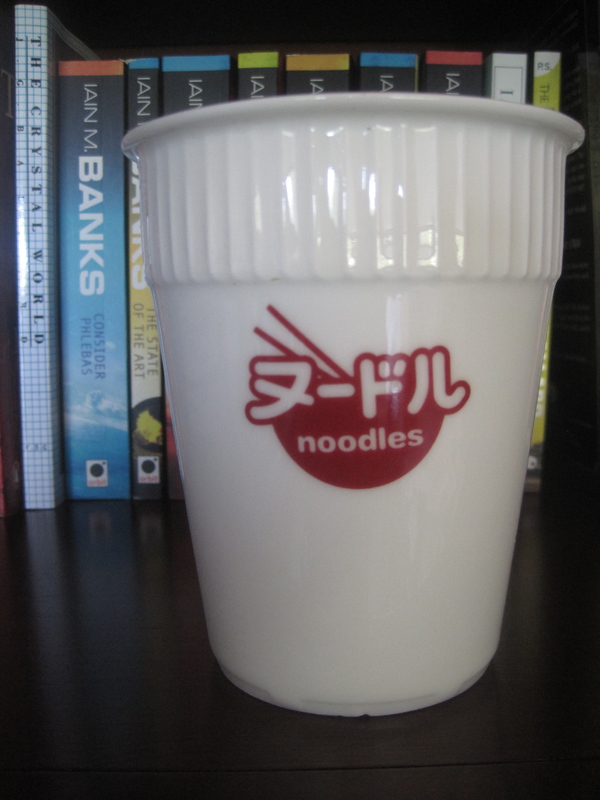 My very own noodle cup, compliments of blog regular Lise, which I promise to put to good use once I actually start making my own noodles. 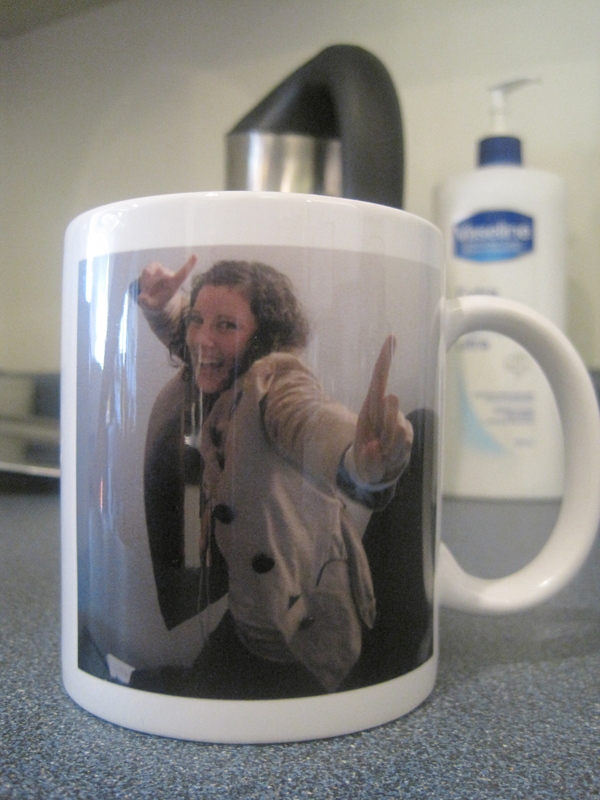 Thanks, Lise! Compliments of blog regular Quade. Thanks, Quade. 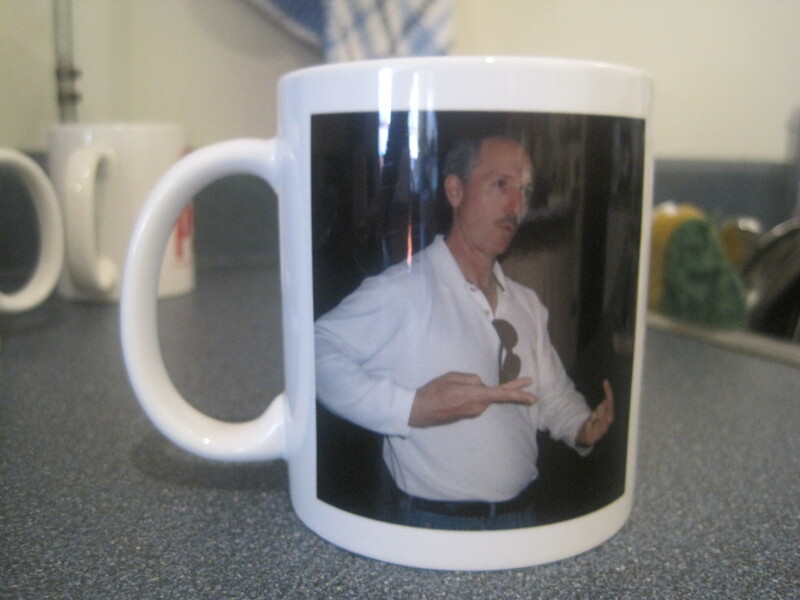 They’ve proven very popular in the front office. 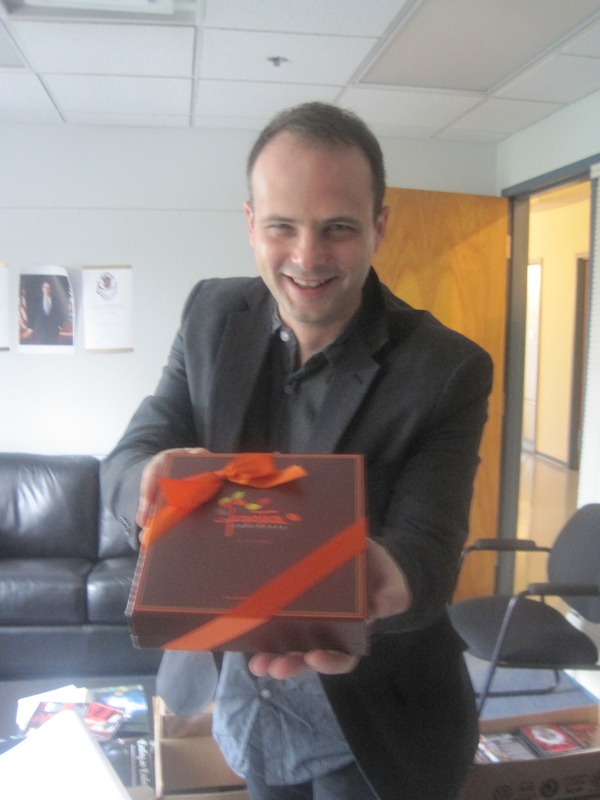 A delectable assortment of Jacques Torres (Mr. Chocolate!) chocolates. Not so much an early birthday present as it is a thank you gift for inviting him to my annual chocolate party (check the archives, ed.). I thought that was really cool and classy of him. Speaking of birthdays, a BIG birthday shout-out goes out today to writer/director/executive producer/good friend/fellow foodie Robert C. Cooper who is no doubt out there somewhere enjoying himself immensely NOT writing. I’m soooooo jealous. Happy Birthday, buddy! Talked to Martin Gero today and, alas, he’ll be unable to join Ivon and I when we hit Tokyo in December. Turns out the Golden Boy will be busy working on a couple of super secret projects of his own. It’s exciting stuff and I can’t say too much, but I will leave you with two words: ostrich gelding. Also putting a damper on things was the performance of my Snow Monkeys in last weekend’s Stargate NFL Fantasy game play. We got our asses kicked thanks to a poor performance by Texans Quarterback Matt Schaub. We’ve fallen to 1-4, but I have high hopes for this weekend’s match-up vs. Petunia’s Crew. Heading into Sunday’s games, I’ve got Bush (Raiders) and Gore (49ers) at the Running Back positions, Marshall (Dolphins) and Harvin (Vikings) at wideout, and I’ve picked up Moeaki (Chiefs) off waivers to bolster the TE position. I’m losing faith in QB Schaub (Garrard [Jaguars] is my back-up and I’m also about to claim Atlanta’s Matt Ryan off waivers) and the love for my team defense (The Baltimore Ravens) continues to ebb. Next Article October 15, 2010: La Carmina! 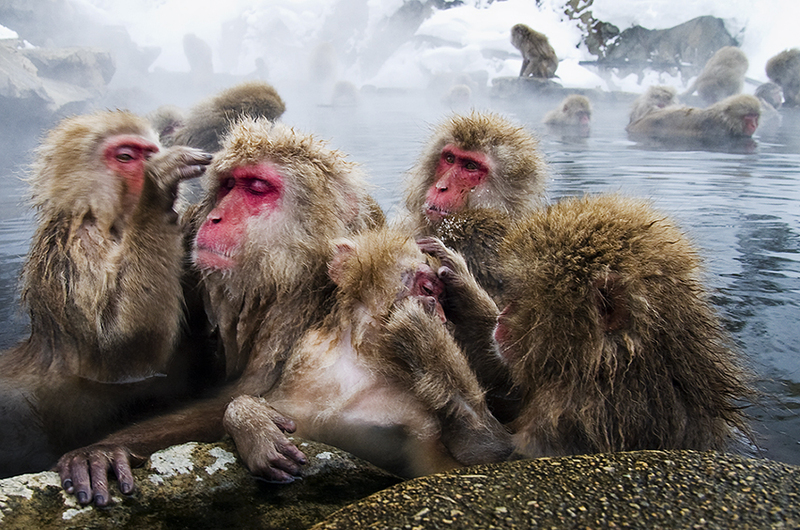 I have always wondered whether Snow Monkeys would have bright red faces if they didn’t sit in a steaming hot bath all day. “ostrich gelding” – a pretty strange duo of words. It won’t be long before the Gruesome Twosome are off to Japan – is Tokyo prepared for the Ivon-Joe invasion? Oddly enough, monkeys are my least favorite animals on the planet. Well, except those cute little marmosets and tamarins. But the larger monkeys – from chimps to gorillas – just remind me of dirty old men for some reason…they kinda skeeve me out (and not in the good rock-n-roll way, either). So, needless to say, your Snow Monkeys are on their own. Hope you get spoilt like crazy! I’m still making your gift..I’m sure this doesn’t surprise you. Hopefully you’ll get it soon…meanwhile I hope you got to enjoy some of the Aussie treats I sent via Ivon with the Super Secret Project. I hear the TimTams were a hit in the office. I suppose I should say I’m off to Armageddon on the weekend…seeing Michael, Ben and Torri and catching up with friends. Its gonna be Super Secret Awesome!! I can’t believe I’m doing better than you in Fantasy Football. I’m a 49er fan….brutal…. I lost this week to someone who hadn’t won a game…yikes!! @dasNdanger The Japanese clip shows how to totally traumatise your children in one easy lesson. Happy Birthday to Mr. Robert C. Cooper!!! Jeff was enjoying the Texan/Giants game, being the big Giants fan that he is, and ecstatic that they won. Well, today is the extension deadline for tax returns in the US, and despite very poor looking odds last weekend of me getting finished, I did get finished. Slept on it overnight and remembered a deduction or two. Without having to have a World War with the school district starting in January and lasting to April, or in this past year’s case, June, maybe I’ll catch up on filing on time for once. For those of you who aren’t friends with me on Facebook, I just want to tell you how fabulous Patrick is doing at the private school. It is amazing what you can do when you are in an environment with people who believe you are intelligent and capable of learning. Today he had such a funny day. He had the entire class cracking up (and I was proud to know that others found him funny). Apparently he was laughing so hard he actually fell off the occupational therapy swing but landed safely into bean bag chairs where he proceeded to laugh even harder. Every day I’m treated to some new astounding or amazing story of something he did or said (yes, as in speak from his mouth, not just sign language; my nonverbal child has become quite verbal in just 3 months–take THAT incompetent school district. As for me, after shattering the large 7 mm x 9 mm left kidney stone, now I have “multiple” stones. I’ve passed 12 in 1 week; wondering how many more are still to come. Geez! Couldn’t he have washed them out while he was up there? Oh no, that would have been too easy. Wooow, le seul livre Asterix et Obélix qui me manque !!! J’arrive pas à le trouver sur le commerce celui-ci. En tout cas, bonne lecture Joseph, Vous allez voir, Asterix est Obélix est très amusant à lire, surtout que comme c’est en français, vous avez ici la version ORIGINALE ^^. Have already given up on Baltimore! Percy Harvin won 5 games for me last week! 4 comps – one with a double header. Woohoo. On the SGU front… watched this weeks episode (thankfully Australia gets it a few hours before Canada!) Another great episode! Can’t wait to see what happens with Telford. I’m leaning towards him being able to communicate with his “friends” by the next time we see him. They made a movie about you. Je ne savais pas que tu lisais le français joseph. Astérix et Obélix est une BD géniale et je suis content que tu l’apprécies. Est-ce que tu connais Rahan ? Je viens tout juste d’en faire la collection avec tous les tomes sortis à ce jour. I am glad it was a good Birthday Party. I am glad your SGU is getting more viewers. I would get interested in SGU and interested in SyFy again if you would crossover Joe Flanigan as Shepperd and the actor who played Todd to finish the pairing of Shepperd/Todd. nice swag collection. I hope it’s all enjoyable, and that much more arrives soon. Thanks for the daily post and good luck on knocking out that script. Even though once it’s finished we’ll suffer months of teases about what it’s all about. Happy Birthday to Mr. Rob Cooper!! Hope it is wonderful! Joe, are you dining out for your birthday, anywhere special? Do that for several days, birthdays should last longer than one day I think..the celebration I mean. And there we strain the extent of my ability to write in French. Long ago, and far away, I studied French in middle school, with an actual trip to Europe (and Japan) for a year between 7th and 8th grades. I sucked up Asterix and Obelix whenever I could wheedle my parents into buying me a comic. Between their exploits, and menus, I can still muddle through written French. Happy Birthday! Today is Hubby’s 51st, time to bake a cake! And by “bake a cake” I mean… well, not ostrich gelding. Best Birthday wishes to Robert! Are you guys breathing a little easier now that the rating appear to have rebounded? Are the other writers bowing down before you, especially one named Carl, since the rebound occurred on your episode? I for one am glad to see the ratings go back up. Have you gotten any word yet on the DVR ratings as well? @ susan the tartan turtle – Yeah, not sure you could get away with something like that in the US, although someone pointed out to me it’s not much different than taking your kid to a haunted house for a good scare. I thought I would resubmit my thoughts and questions from Awakening just in case you don’t go back three days for mailbag questions. Well so many questions! First my thoughts (Spoilers)….excellent work Mr. Mallozzi you had me on the edge of my seat wanting more..the news aliens are cool and definitely friendly i think…why stun and not kill. Telford being left behind…didn’t see that coming.I have a feeling we’ll see that ship again. T.J. is a badass! 1.) “Homeworld Security is expecting us” does that mean Stargate Command is in D.C.? 2.) Is there a working gate on the seeder ship? 3.) How much longer do we have to wait until Rush’s Secret is found out? 4.) IS there a reason for the bridge of the Destiny rising from the hull other than being cool? 5.) Should we wait until Fridays to submit questions on the latest SGU episodes since you are waiting for it to air in Canada? Joe I am glad SGU is getting more viewers from this side of the border, however If you were to finish the Shepperd/Todd storyline by doing SGA cameo appearance with John Shepperd(Joe Flanigan and the actor who plays Todd) Todd that would draw my attention to SGU. As it stands now, I record NCIS and NCIs LA on DVR while working. I could stop recording NCIS and do SGU because I am losing interest in NCIS except for Ziva, she makes the show. When Rush is brought to the gate construction room aboard the seed ship whose idea were the SG1 musical cues? I thought that was particularly awesome and made me smile.